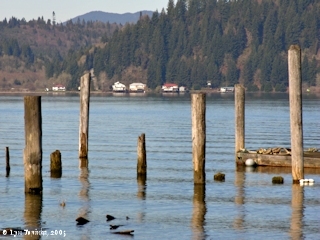 Click image to enlarge Mayger dock, Mayger, Oregon. Image taken August 28, 2012. 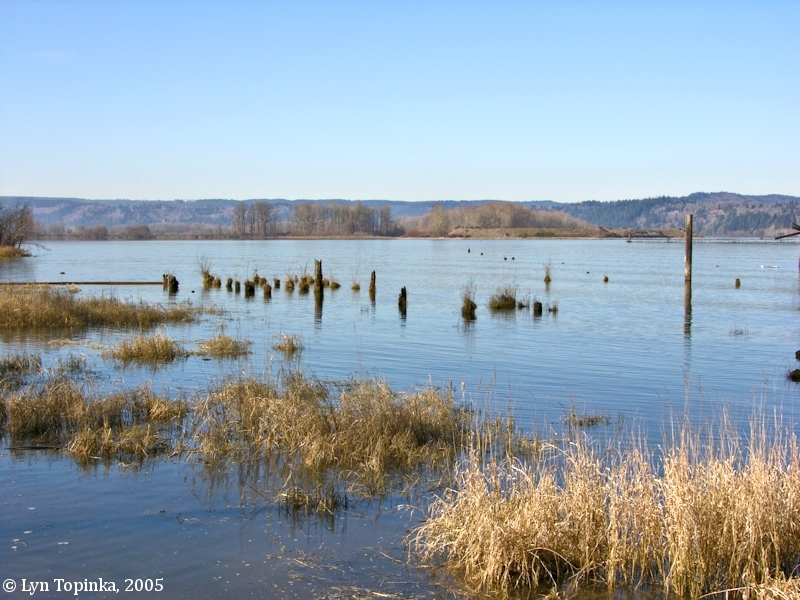 Mayger, Oregon, is located on the western shore of the Columbia River at River Mile (RM) 57.5, on the west flank of Green Point. 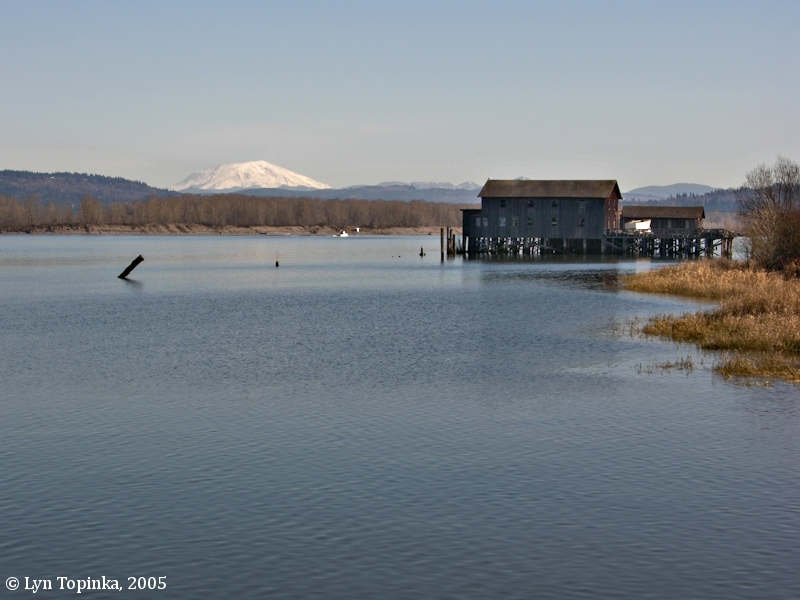 Upstream is Walker Island and Rainier, Oregon. Downstream is the Oregon town of Clatskanie and the Clatskanie/Beaver Slough floodplain, the Oregon development of Port Westward, and Wallace and Crims Islands. 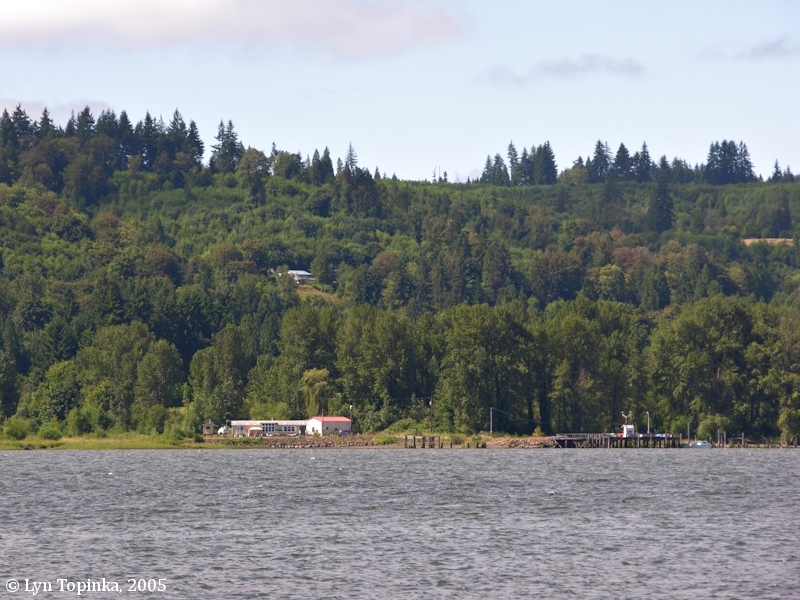 Accross the Columbia on the Washington side is the Washington communities of Stella and Willow Grove and the massive cliffs of Oak Point. Mayger was named after an early settler, Charles W. Mayger, a native of France who first arrived in Oak Point, Washington about 1865, before settling on the Oregon side of the Columbia River. The U.S. Bureau of Land Management, General Land Office Records, show a Charles Mayger being issued three land titles on April 10, 1882, for nearly 400 acres of parts of T8N R3E Section 30, under the 1820 "Sale-Cash Entry". The Mayger Post Office opened in 1889 and closed in 1961. 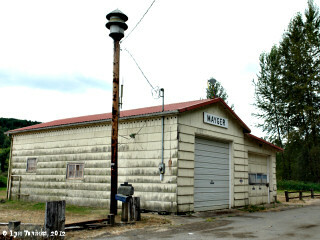 Click image to enlarge Mayger, Oregon, from Willow Grove, Washington. 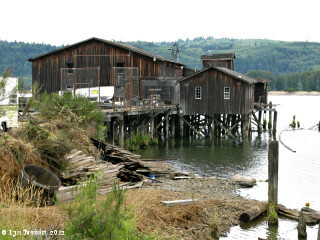 View of dock and surrounding area at Mayger, Oregon. Image taken July 28, 2005. 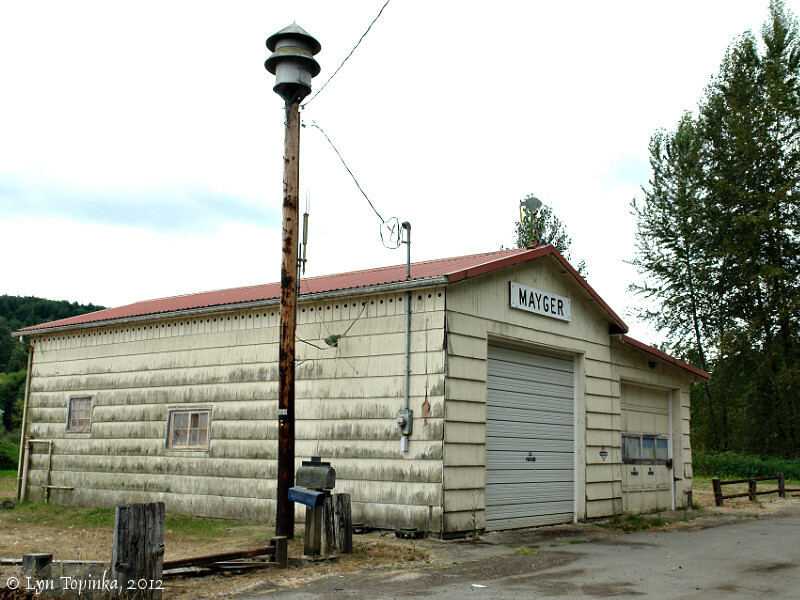 Click image to enlarge Mayger, Oregon. Overcast and gray day. Image taken August 27, 2012. 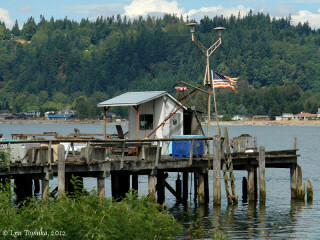 Click image to enlarge At Mayger dock, Mayger, Oregon. Sunny morning. Image taken February 21, 2005. 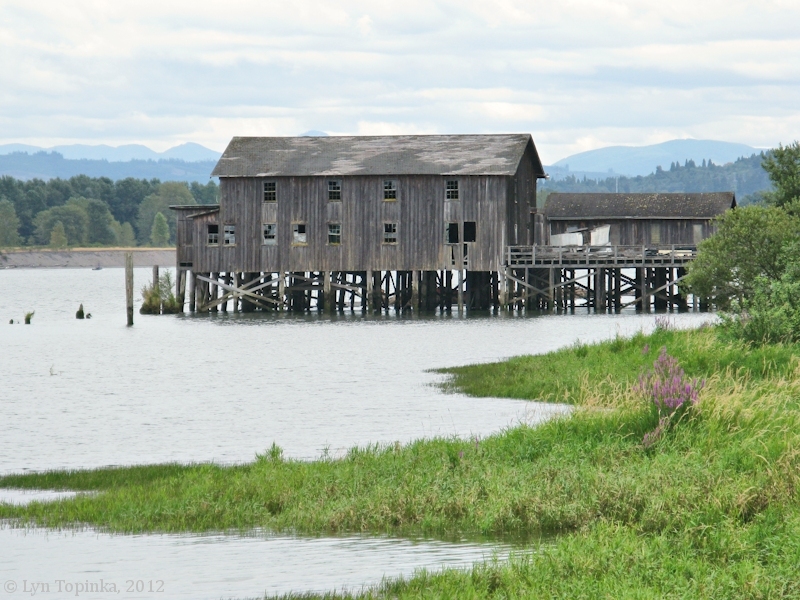 Email to me from Russell Kallio, now living in Alaska, who grew up in the Clatskanie area during the 1960s through 1980s, with fond memories of Mayger and the fish station there, of Wallace Island, and of the Clatskanie, Oregon area. "Hi i was looking up some history on lewis and clark and came across your pictures of the last 50 miles or so of their journey. i must say they brought back a flood of memories for me since i grew up hunting fishing and trapping on the very same sloughs along the lower cloumbia river. (i grew up in clatskanie) it was my ol hometown altho now it has since changed. 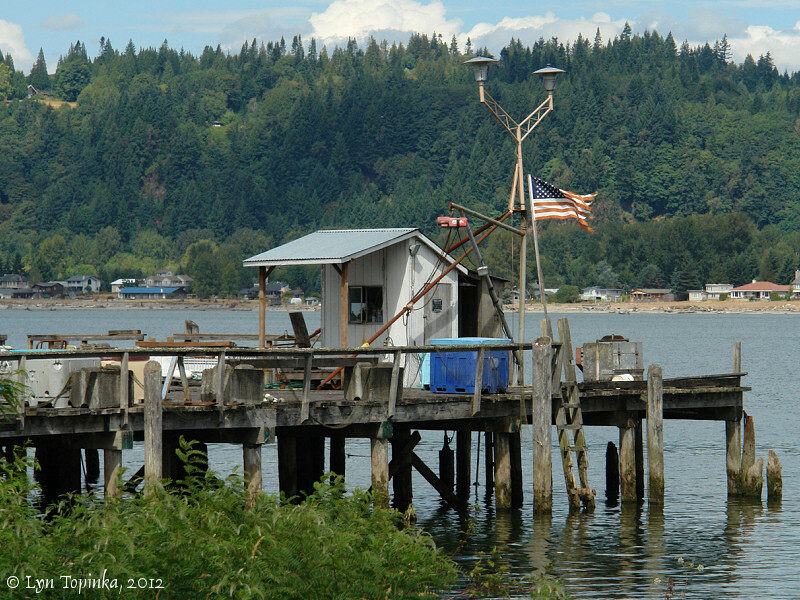 ... mayger beach and fish station was a favorite swimming spot, we used to jump off the roof of the fish station into the columbia . wallace island we called pig island because of the pigs turned loose there and they went feral, they were quite good eating tho. nothing like lean pork. i recall fishing for sturgeon in that area as well as a few other secret spots along the river bottoms. 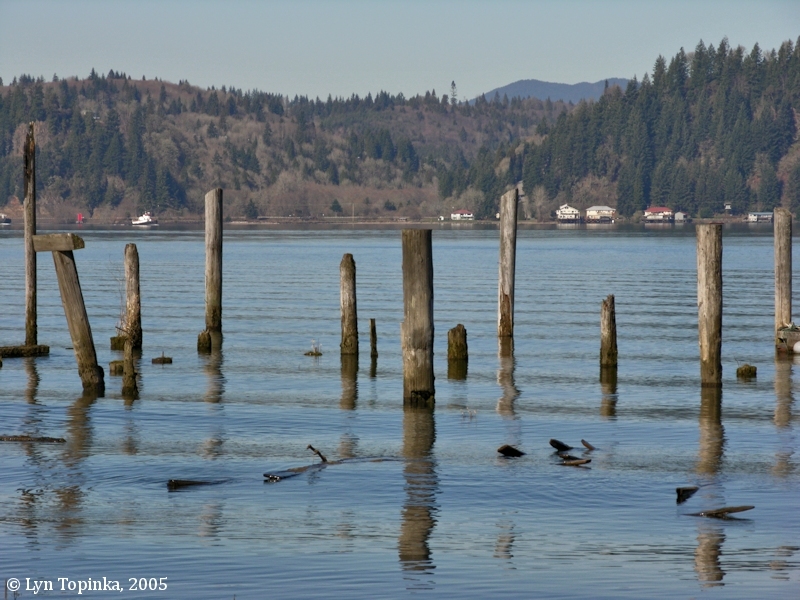 ... thanks again Russell Kallio, October 5, 2006"
An early 1900s fishing station is located at Mayger, just downstream of Green Point. Good views of the station can be had from across the Columbia at the park at Willow Grove, Washington. 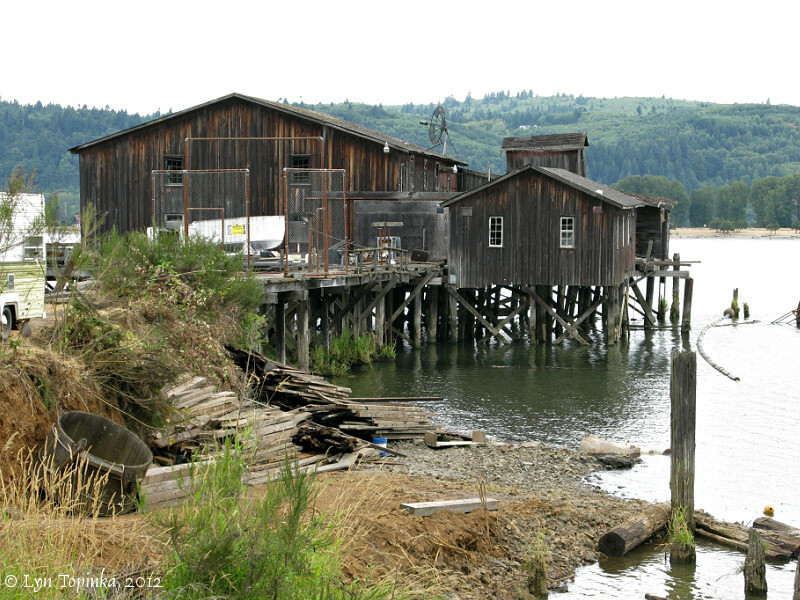 In the early 1900s the docks at Mayger contained net sheds and fish-buying stations. Click image to enlarge Mayger Fish Station, Mayger, Oregon. Image taken August 27, 2012. 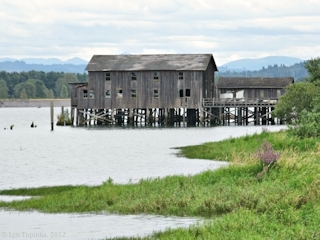 Good views of Willow Grove and Stella, Washington, can be had from Mayger, plus the upstream end of Crims Island. Great views of Mount St. Helens can also be had from the Mayger area. 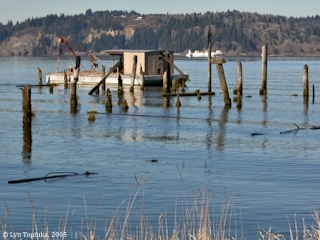 Click image to enlarge Looking across the Columbia River towards Stella, Washington, from Mayger, Oregon. Image taken February 21, 2005. 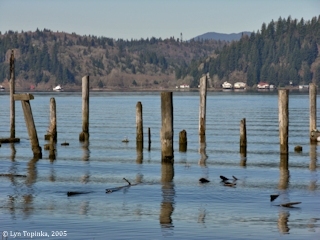 Click image to enlarge Stella, Washington, from Mayger, Oregon. Image taken February 21, 2005. 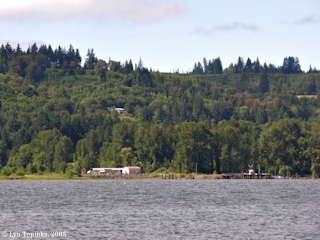 Click image to enlarge Crims Island from Mayger, Oregon. View looking downstream from Mayger, Oregon. Image taken February 21, 2005. Click image to enlarge Old Fishing Station, Mayger, Oregon, with Mount St. Helens, Washington, in the background. Image taken February 21, 2005. 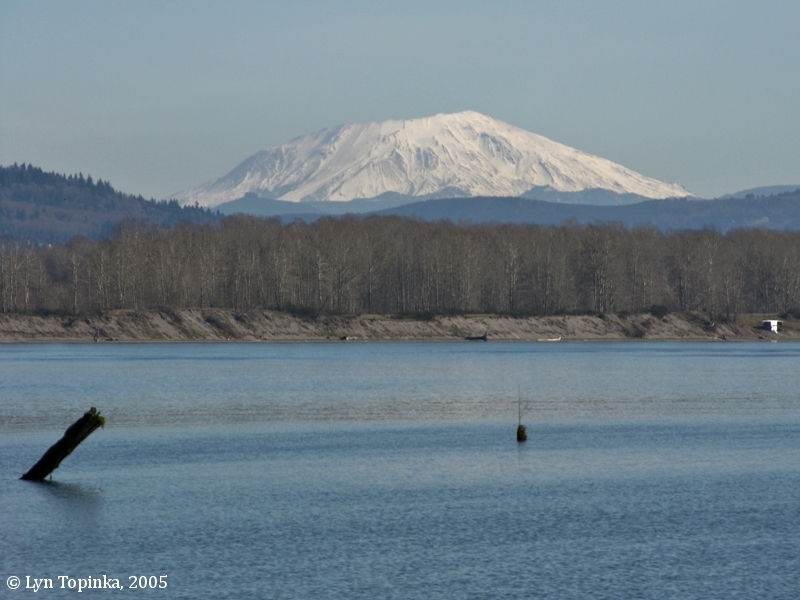 Click image to enlarge Mount St. Helens from Mayger, Oregon. Image taken February 21, 2005.